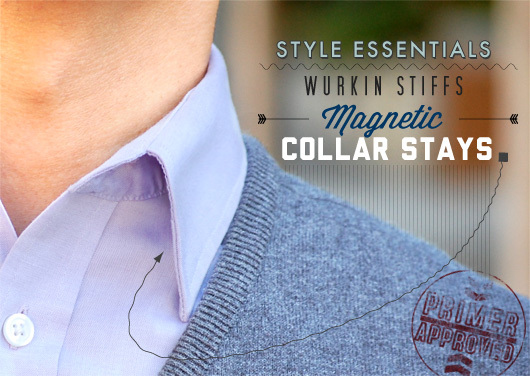 Keep your collar tips under control with Wurkin Stiffs magnetic collar stays. If you're a guy between the ages of 17 and 50 you probably wear a button up shirt most days out of the week. And, with the casualization of style over the last few decades, there's a great chance you wear that button up shirt without a tie. In fact, the button up shirt with the top one or two buttons unbuttoned is almost the standard uniform for young guys today. If you take a look at our style articles or The Getups you'll find a majority of them include a button up shirt being used in a casual way. But the reality is, collared shirts were designed to be worn buttoned to the top and sealed with a tie. When we leave the top buttons undone something happens – the collar opens, the shirt bends and folds on itself: The dreaded collar flare. I guarantee you've experienced it. One side of your collar looks good and in place, and the other is going all crazy, halfway to your shoulder. Or worse, both sides seem to be heading to the hills and you've got a Saturday Night Fever thing going on. Up until recently no one has even attempted a solution, a curious thought considering all the tacks, bars, links, and straps folks have developed over the history of style to keep their garb perfectly in place. Luckily, one young entrepreneurial man took on the collar flare. Like all great inventors he saw a problem and devised a cunning and simple solution to save all of mankind. Jonathan Boos invented Wurkin Stiffs. The collar stay or collar bones, are those little plastic things that come with your shirt to slide into the underside of your collar to keep them stiff. Jonathan created magnetic collar stays, and uses a strong magnet placed on the inside of the shirt to hold the tips of your collars in place, wherever you want them. My first real desire to check out Jonathan's Wurkin Stiffs came last winter. A common go-to for me in the winter months is a button up shirt with a v-neck sweater over the top. 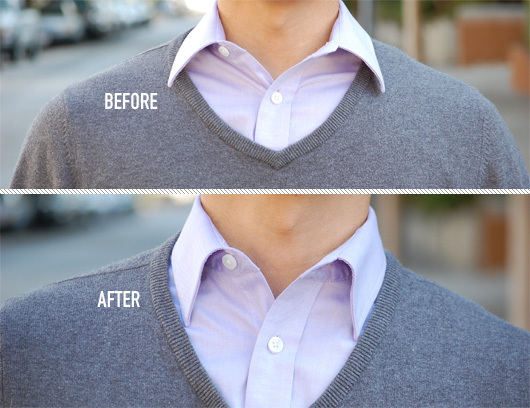 I prefer to keep my collar tips on the inside of the sweater's neckline; versus folding them over the top of the v-neck as the trend was a few years ago. I found this to be nearly impossible to keep in place. One side would always pop out and flare off to the side, and I felt it was a sloppy end to an otherwise solid attempt at dressing well. Wurkin Stiffs perform as promised. I've been using them for the last several weeks regularly, and they keep my collar tips right where I place them, all day. The magnets are strong, almost surprisingly so. I was concerned at first that the tiny little magnets would be easy to lose, bump them during the day and they'll slide off never to be found again. But fortunately the magnets are so strong I don't see that happening. We did a great profile on Jonathan some time ago about his experience founding Wurkin Stiffs, starting a company, developing a product, and getting it on shelves. 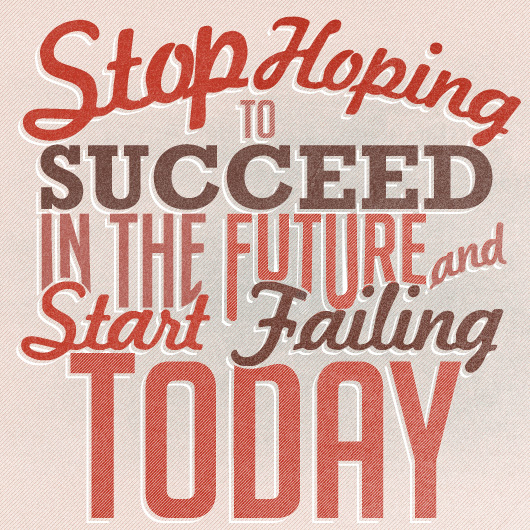 If you've got an entrepreneurial spirit it's definitely a solid read. You can get a pack of 6 Wurkin Stiffs Power Stays on their site for $40. Or if you just want to try a single pair (which is probably enough for most guys) you can pick up a box on Amazon for $20.50. 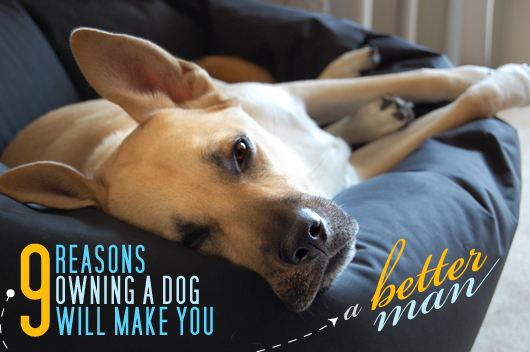 Check 'em out, you'll be glad you did. After looking at the price of these, I just picked up some metal collar stays and some 3/8-Inch by 1/16-Inch rare earth magnets, both from Amazon. You end up with a variety of numbers and sizes for the same price as one of the Wurkin Stiffs. He was also on Shark Tank last season. Glad to see the review; I’m going to pick some up. I’ve been wearing these for years and love them. I’m actually wearing a pair right now. Each year this is my go-to gift for friends. Nice review! My shirts do not have removeable collar stays, can a tailor alter shirts to allow for this? Has anyone done this? If so, how much did it cost? I too am wondering the same thing as Steve. How would I use collar stays if they’re either not removable or doesn’t even exist in the collar. I smell a new invention? Jay, It’s a Merona dress shirt from Target. Oh wow I never knew these existed! These will be perfect for my husband’s work shirts which after two washes the collar goes all over the place and ironing doesn’t help at all. Thank you for sharing!!! This is why I keep coming back to Primer. I hate it when the collar goes all crazy! 17?!? That’s still high school. Even beyond that, as the site itself implies, the vast majority of college-age men are not wearing collared shirts.